drop 240 ft in one mile. In our travels we’ve seen lots of canyons. 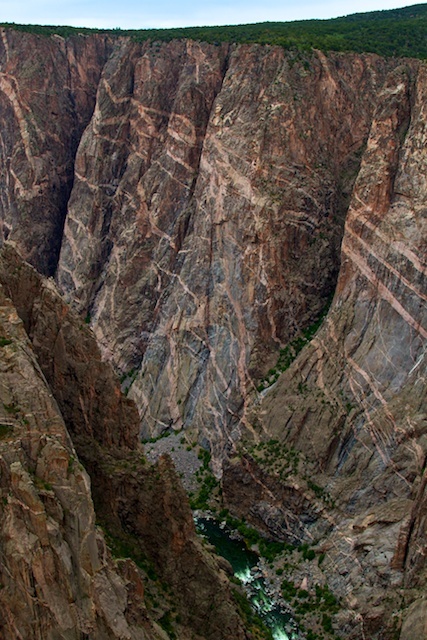 Canyons of all shapes and sizes, but none combine the depth, sheerness, narrowness, darkness, and foreboding of the Black Canyon of the Gunnison River. Native Americans avoided it. The Utes dubbed it “Much rocks, big water” but stayed out. Europeans eventually conquered it in 1882 with a railroad route through the canyon, but it was costly & difficult to operate and eventually abandoned in 1955. Today the river is somewhat tamed by the dams up river, but still treacherous. 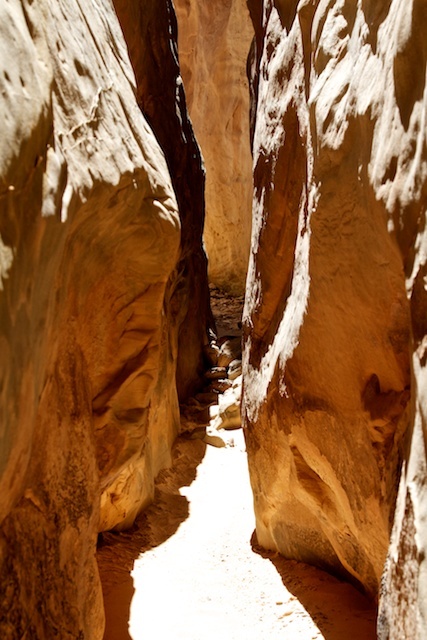 The bottom of the canyon is accessible, but only to the eager, willing and proficient. Expert kayakers must be prepared to drag their gear around dangerous and impassable stretches of the river to experience the thrill of class III-V rapids. Advanced rock climbers can scale the sheer cliffs of the inner canyon or hikers can spend 2 hours scrambling down unmaintained draws and 4 hours crawling back up. As if rapids, cliffs, and steep draws (one aptly named S.O.B) aren’t a deterrent; poison ivy grows abundantly in the draws and along the canyon floor, ticks lay in wait in the gulches ready to pounce and afternoon thundershowers can make for a bad hair day. Fortunately for those of us not willing to drag a kayak, rappel down a cliff or crawl through poison ivy beating off ticks, there are paved roads and hiking trails along the north and south rim, (so we can at least look down with that flutter in the stomach) and one set of 16% switchbacks to the river at the eastern end of the canyon. The National Park has 3 campgrounds: the South Rim provides electricity for tents & RVs, the North Rim has dry camping for tents & RVs and the East Portal along the river, is limited to tents and tiny trailers (max total vehicle & trailer length of 22 ft.) We opt to stay near the north rim in the Iron Creek campground of Crawford State Park. We have water, electricity, great views of the rolling hills, the reservoir and a small herd of deer who visit every morning and evening. Black Canyon Road, near Crawford is the only access to the north rim. There’s a small ranger station but no visitor center. 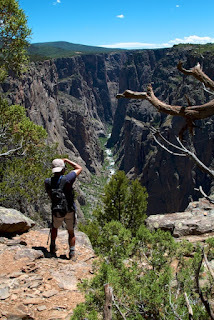 The Chasm View Nature Trail starts near the campground and leads to a number of vista points, where we can view 2,000+ ft. sheer cliffs and look straight down to the canyon floor, safely behind heavy guard rails. The North Vista Trail starts near the ranger station. After crossing the mesa, the trail winds along the canyon rim. There are spur trails that take us right to the edge. No civilized barriers here… just slick rock and sheer cliffs… down… down… down. At the three-mile mark, we stop at Exclamation Point. 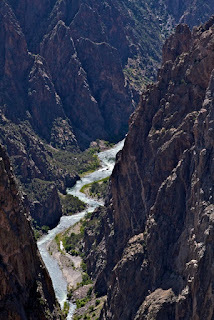 Here we have a strait view of the river through the canyon. The cliffs are so steep that the river is in full sun for only 33 minutes a day… and we hit it pretty close to this window. The south rim is the civilized rim. We start at the visitor center and catch a short film about the Canyon. Then it’s a cruise along the South Rim Drive with stops at all of the turnouts. Some of the views are right off the road, while others have a short hike to the viewpoint. Every view is breathtaking. The East Portal Road is the only access to the river. 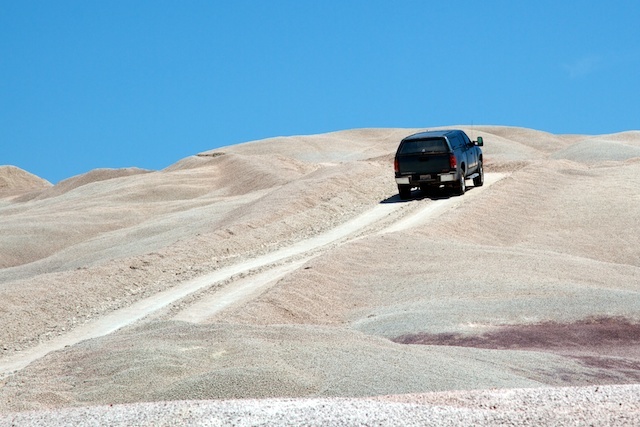 It’s paved with a series of 16% grade switchbacks. At the bottom of the road, the Gunnison diversion dam feeds the GunnisonTunnel. This 5.8 mile engineering marvel diverts water from the Gunnison, through the mountain, to the arid Uncompahgre Valley near Montrose. The road ends at the Crystal Reservoir Dam (no public access to the reservoir here.) The river is flowing and from the number of anglers present we assume that this must be a good spot for fly-fishing although no fish were harmed during our visit. Besides great scenery, for driving and hiking around the canyon there are numerous roadside fruit & vegetable stands, selling local organic goods… Our Colorado favorites: Olathe Sweet corn and Palisade Peaches are still on the menu… YUM! 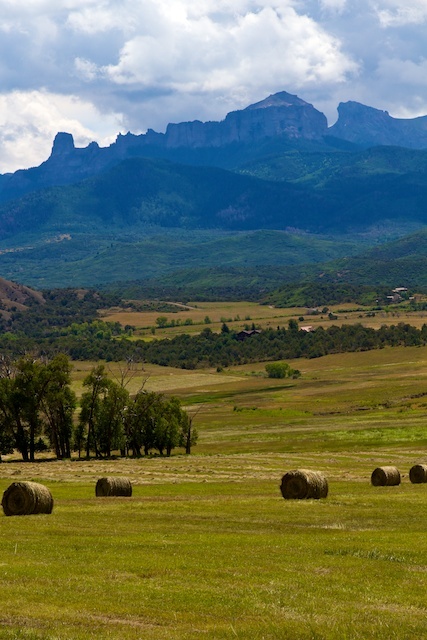 Ridgway, Colorado lies in the Uncompahgre Valley, surrounded by the rugged peaks of the Cimarron’s and San Juan Mountains. 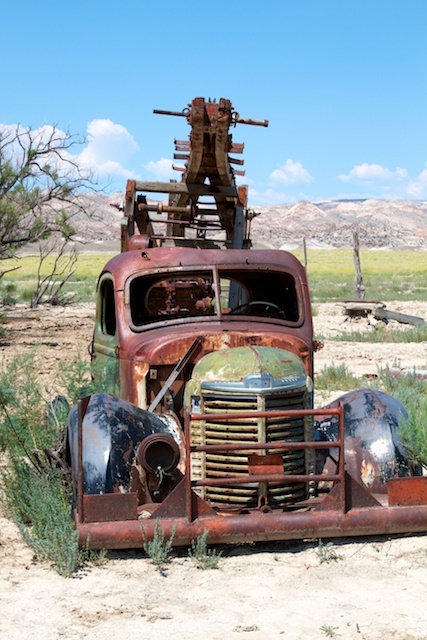 The town was originally founded as the headquarters for the Rio Grande Southern narrow gage railroad serving the areas rich gold and silver mines, ranches and farms. In the 1960’s the town and surrounding landscapes served as locations for various western movies, including How TheWest Was Won and John Wayne’s True Grit. Today, the railroad is gone, the mines are closed but ranches still dot the valley. The town is home to art galleries, studios, boutiques, restaurants and is designated a Certified Creative Arts District by the State of Colorado. It’s like walking through a Ralph Lauren Catalogue, which is no surprise, since the designer’s 1,700 acre Double RL Ranch is just outside of town. The Pa-Co-Chu-Puk (Ute for Cow Creek) Campground at Ridgway StatePark is our home this week. 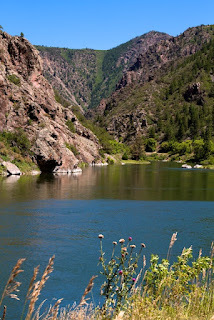 Our full hook-up spot backs up to the Uncompahgre River below the Ridgway Reservoir Dam. Just south of Ridgway at the base of the San Juan Mountains is the town of Ouray (pronounced You-Ray.) 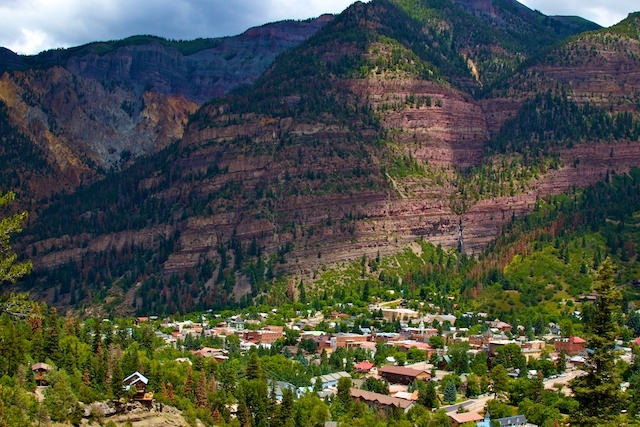 Ouray is famous for year round spectacular scenery, shopping, dining and hot springs. In the winter the frozen waterfalls in the Ouray Ice Park draw climbing enthusiasts. We go to the Ouray visitor center to get the 411 of the area. The Ouray Historical Museum is housed in the original (1887) Ouray Miner’s Hospital. Each of its 30 rooms hosts a different collection, including: mining, gems & minerals, the original hospital, ranching, railroad and Native Americans. The City of Ouray Box Canyon Park is just above the city. 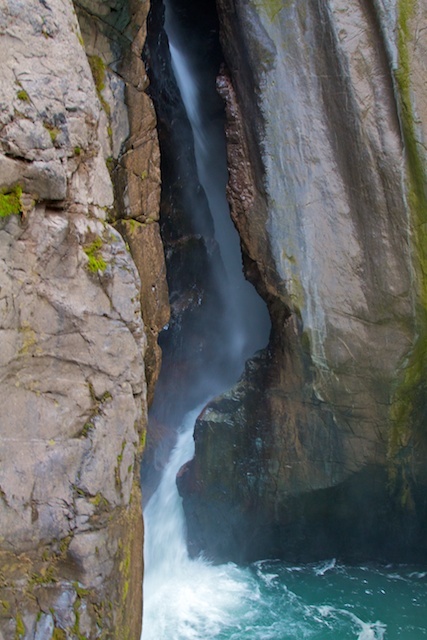 It boasts a nature center, the Box Canyon Falls and three short trails. We start with the High Bridge Trail. This takes us up to a footbridge at 8,100 feet above sea level that crosses the falls and connects to the Ouray perimeter trail. The short climb rewards us with outstanding views of the mountains and surrounding forests above the town. 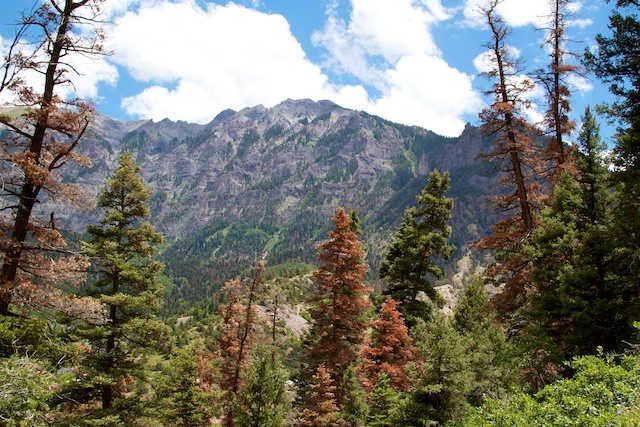 Unfortunately a large number of evergreens are victims of the Pine Bark Beetle. The Falls Trail is mostly expanded metal walkways and stairs. It winds along Canyon Creek all the way to the falls. 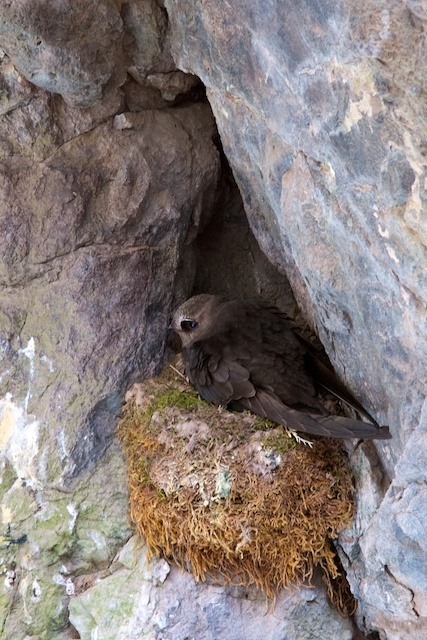 The thundering water cascades between and behind walls of stone it’s wet and loud, but that doesn’t discourage the rare Black Swift that summer’s here in the Rockies. The final Nature Plant Loop winds along the creek, past the hot springs pipe that feeds the public hot pools in town and back to the visitor center. 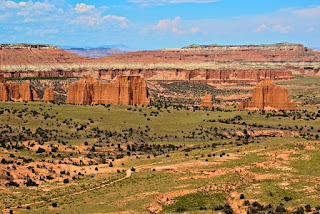 It only takes a couple of hours to drive from the Fruita Campground in Capital Reef National Park to Fruita, Colorado. 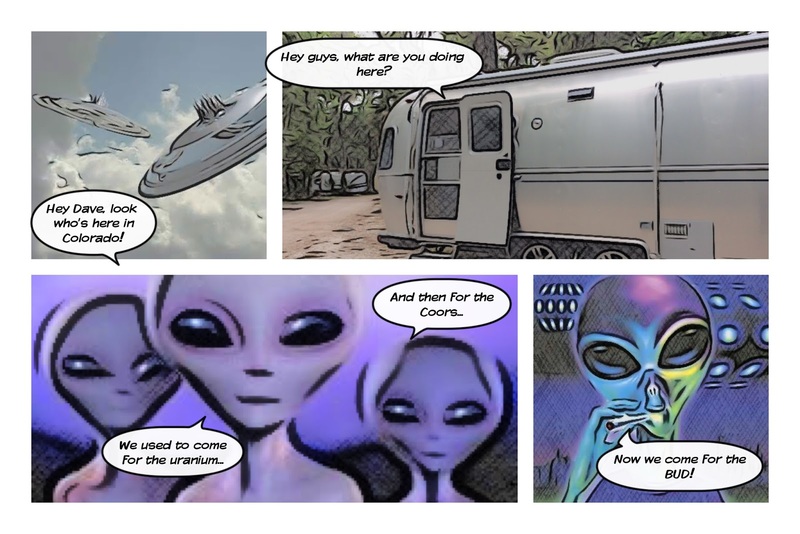 We book a few nights at the Monument RV Resort, just a few miles down the road from the Colorado National Monument and down the street from the Dinosaur Museum and across the street from the James M Robb – Colorado River State Park. The Campground is clean, the staff friendly, WIFI is present but not robust and spaces are close together. After grabbing a forgettable dinner at the Chinese restaurant down the street we stop by the State park for the 411 on camping there. Walk-ins can get available spaces for up to 3 days. Everything else is booked on-line through Reserve America three days in advance or more. There is also a day use fee of $7 per night, or an annual park pass for $70. We immediately go on-line and book 4 nights. Once we move across the street and see what a great spot we have; full hook-ups, laundry facilities and stunning views of the red cliffs, we go back on-line and book the next 4 nights. We also purchase an annual pass. This gives us a total of 12 days here in the Fruita/Grand Junction area. The Dinosaur Museum is a perfect diversion on the first rainy day. The exhibits are well done and are geared to both young and not so young visitors. 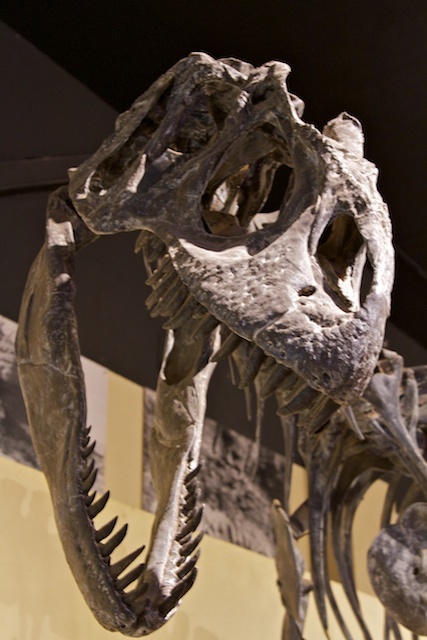 There is a lot of current information on new paleontology discoveries including some of the dinosaur egg and embryo exhibits that we saw last summer at The Yale University Peabody Natural History Museum. The Museum of Western Colorado in Grand Junction is light on artifacts but rich in information about the area. Lots to read here with small displays about the earliest nomads, the pre-Colombian Fremont culture and the Native Ute tribes. The bulk of the museum is dedicated to more recent (as in the last 200 years) history of the local economy. The precious metal mining busts and booms of the 19th and 20th centuries (including a replica of an uranium mine) and the cowboy culture complete with famous gunslinger weapons. 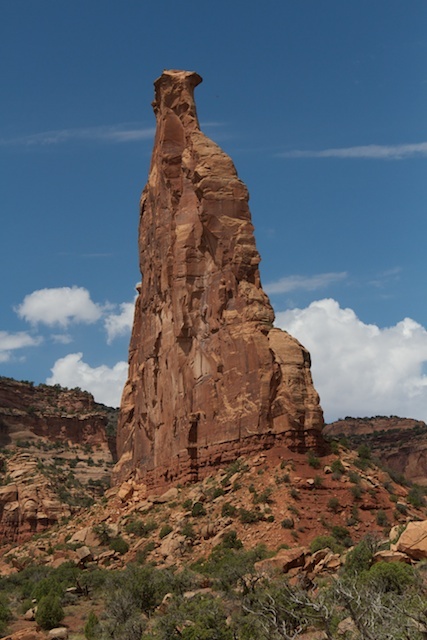 There is also a tower to climb and get a great 360° view of the entire valley and surrounding mesas. 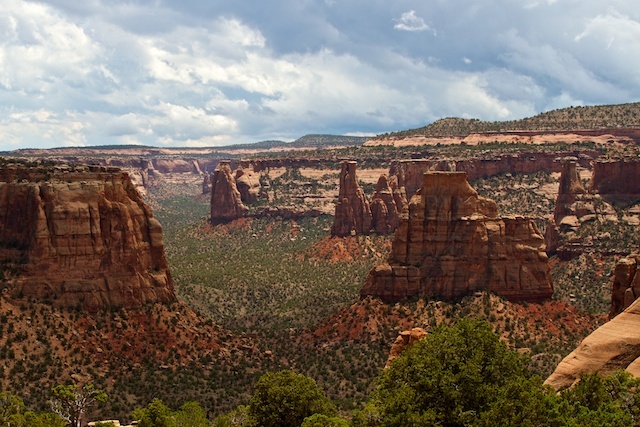 The Colorado National Monument offers spectacular scenery and some challenging hikes in a compact footprint. 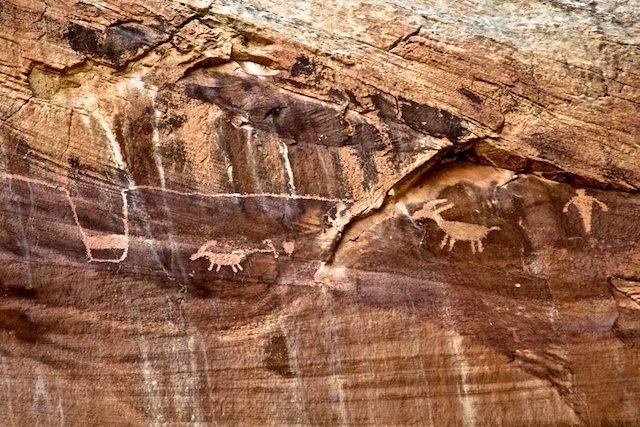 At the visitor center we pick up trail maps and a BLM handout for ancient petroglyphs and pictographs in the area. The drive along the rim with sheer cliffs and a distinct absence of guardrails is not for the timid, but they still drive it and stop on a blind curve and wave us to pass… argh! 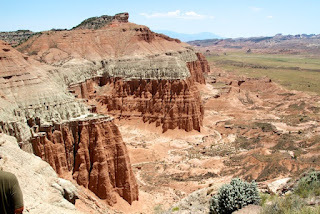 From the top of the canyon we do a couple of hikes, the short Canyon Rim Trail grants great views of the colorful Wedding Canyon, Window Rock, the Book Cliffs, the Colorado River and the town of Fruita. 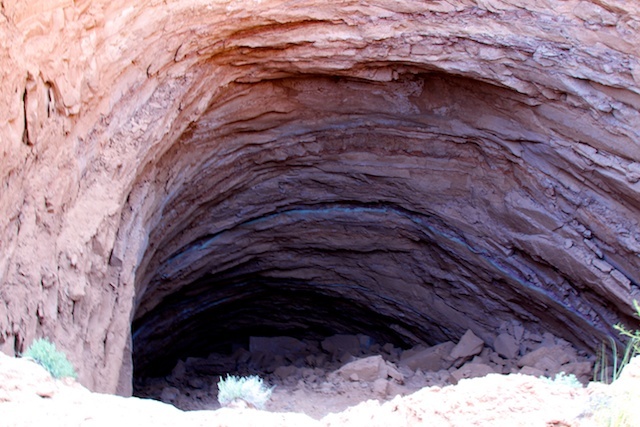 The Coke Ovens Trail, skirts just below the top of the canyon with views of the iconic monuments. From the bottom of the canyon we take the Monument Canyon Trail to Independence Monument and loop back along the Wedding Canyon Trail. Along the way we hear what sounds like gunshots reverberating in the canyon. Once around the corner we see the source of these sounds. 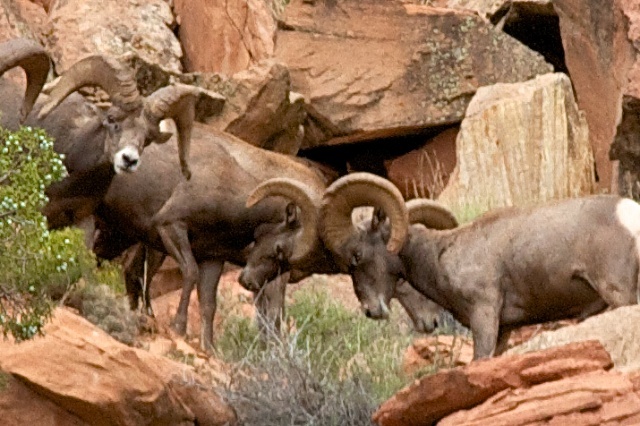 A group of six young Desert Big Horns are gathered in a circle (much like a Rugby scrum) practicing bashing heads. The rest of the herd is up the canyon with the top ram carefully watching over his haram. The Grand Mesa the largest flat-topped mountain in North America dominates the Grand Junction Skyline. Hwy 65 winds up past the Powderhorn Ski Area, across the Mesa and down the other side. 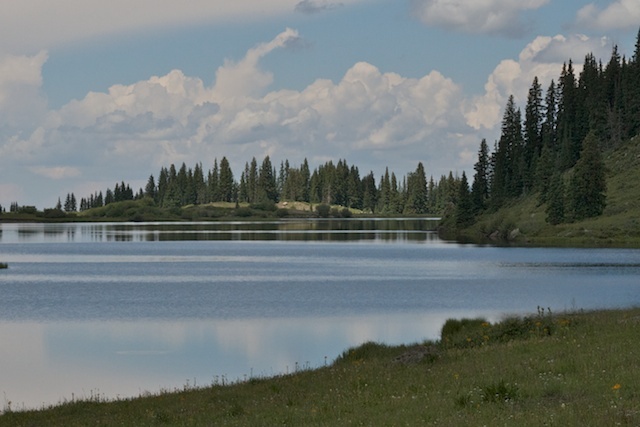 At 10,000 ft above sea level, the mesa top is a variety of dense forest, colorful alpine meadows dressed in a plethora of wild flowers and sparkling mountain lakes. There are lots of camping opportunities here, down dirt roads that turn to mud with the afternoon thundershowers. At one point while exploring the area, we stop and help a guy who stopped to take a picture. His truck is axel deep in the muddy turnout. All it takes is a length of rope and Dave pulls the other truck onto solid ground. 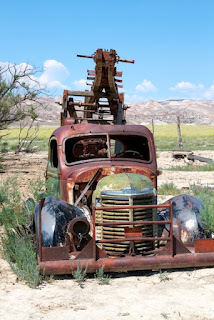 Both times we explore the Grand Mesa, instead of taking the civilized highway back, we opt for the more adventurous route down the unpaved narrow End of Land Road. It’s a shorter distance and much more exciting! Just northwest of Fruita, Highway 139 connects the towns of Loma and Rangely through the Canyon Pintado HistoricDistrict. 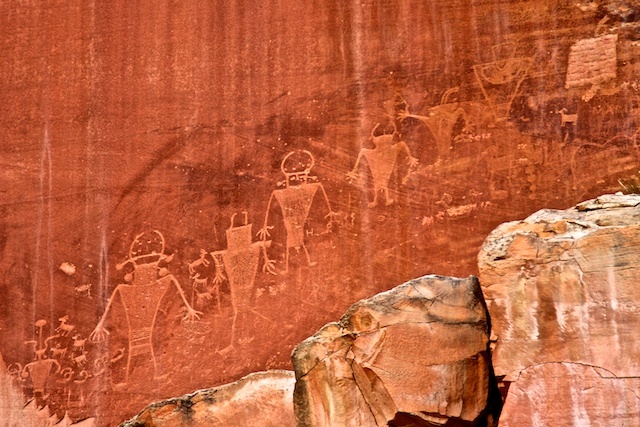 Along this road are nine sites of Fremont Culture and Ute petroglyphs and pictographs. We use the BLM printout with a map and detailed descriptions of the sites that we picked up at the Colorado National Monument visitor center. There are also signs along the highway and information at each location. Some of the sites are visible from the road; others a short hike from the highway. Dinosaur Hill with a large dinosaur bone imprint in the hillside along the highway looks interesting so we stop. The hiking trail winds around the hill where in 1901 a mostly complete 70-foot long 30 ton Apatosaurus skeleton was exhumed and shipped off to what is now known as the Field Museum of Natural History in Chicago. As far as Dino-sites go, there’s really not a lot to see here except a rock outline on the hillside where the bones where the skeleton was laid out prior to shipping, and the blocked off opening to the tunnel where the skeleton was exhumed. The interactive signs are missing or so faded that they’re tough to read. 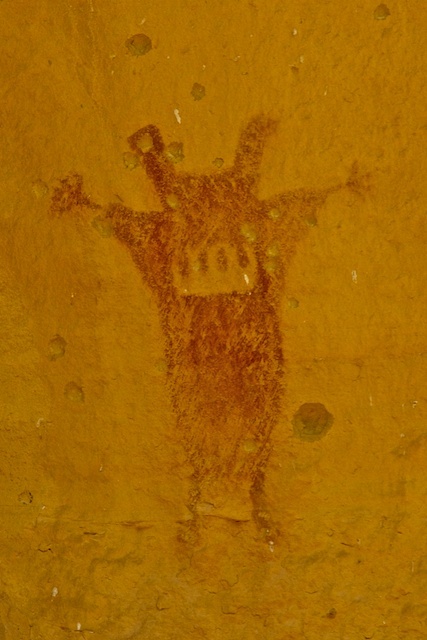 The best feature is the imprint of a large dinosaur bone that was illegally removed – the one visible from the highway. It’s like those movie trailers where the only good scene in the movie is the one in the trailer. It’s a hot short hike through high desert overlooking the Colorado River and the town of Fruita, where dinosaurs used to roam and their ancestors: birds and lizards (depending on which school of paleontology you subscribe to,) still call this hill home. Staying this close to a larger city has its advantages. We can shop at REI and Cabellas for our outdoor needs. The City Market has good selections for most of our foraging needs. But once we discover Palisade Peaches (fuzzy balls of juicy goodness) and Olathe Sweet Corn (probably the best in the world) we frequent the roadside fruit stands. There are also lots of restaurants to choose from when cooking is not on the menu. We only eat out a few times, with the aforementioned forgettable Chinese dinner, another average Mexican meal and a Sushi surprise. No Coast Sushi has two locations, one in Grand Junction and a new location in downtown Fruita. We sit at the Sushi Bar so we can interact with the Chefs. Traditionalists can enjoy Nigiri and Maki Sushi with fresh seafood flown in from Hawaii 3X a week. They also offer innovative rolls with regional ingredients created by local chefs. We take a chance and order a couple of their specials. The Smoked Duck Roll: with shitake mushrooms, asparagus, fresh mozzarella, tea-smoked duck, hoisin, raspberry, cilantro and gyoza strips. If it looks like a Sushi roll and tastes like a duck is it still Sushi? Regardless it tastes really good! The Cougar: fried oysters, cucumber and cream cheese wrapped in marlin with wasabi tobikko, ponzu-katsu sauce and Japanese Mustard has more traditional ingredients and a bright combination of flavors and textures. All of the specials are created by the No Coast Chefs and they are constantly developing new items with hopes of making the menu. Our chef treats us to her version of a traditional soba salad, with glass noodles in lieu of the soba topped with a diced octopus ceviche, it’s not on the menu yet but with the great balance of flavors and textures it’s probably only a matter of time. All this and a bottle of Sake and we’re happy glampers. 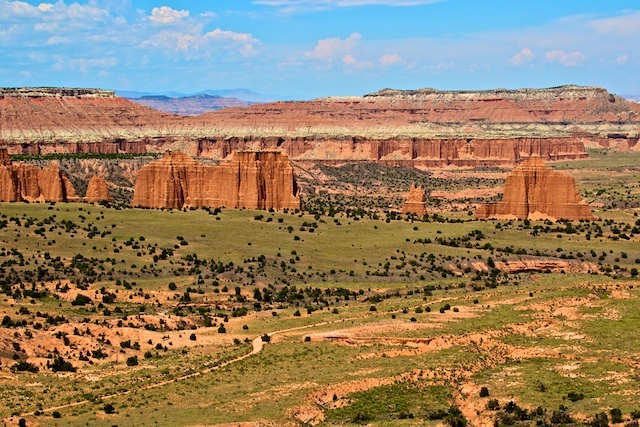 When forces built the Colorado Plateau 65 million years ago, they created a geologic monocline (translation: a wrinkle on the earth’s surface.) Now this is not just any small wrinkle but a hundred mile folded bulge in south central Utah, known as the Waterpocket Fold. This warp in the earth’s crust is the reason for the Capitol Reef National Park. There are three distinct areas of this park with varying degrees of difficulty to explore. 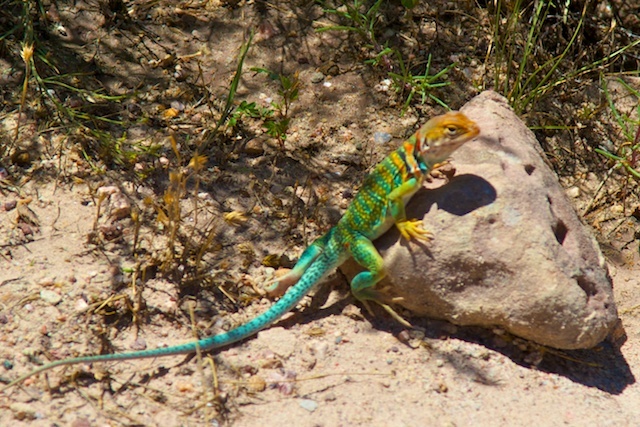 Near the visitor center, along highway 24 is the Fruita section. This is the civilized part, with paved roads and maintained trails where the average visitor stops for 1-2 hours before heading to Arches, Bryce Canyon or the Grand Canyon. 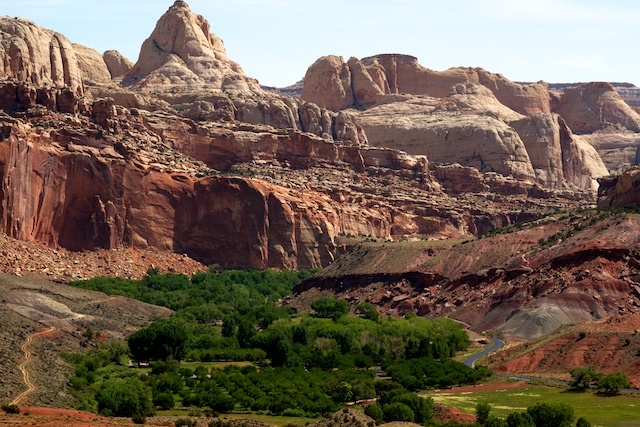 95% of Capital Reef Visitors see only this section of the park. Despite the human presence, wildlife flourishes here. In addition to the usual collection of squirrels and chipmunks, lizards and snakes: Deer and wild turkeys regularly cruise through the orchards and the campground. Ringtail raccoons are spotted at night, stealthy black bears leave signs but are rarely seen and mountain lion’s have been filmed stalking deer in the orchards and strolling along the canyon rim. Civilization is nothing new to this protected section of the Fremont River. Archaic hunters and gatherers began migrating through the area around some 10,0000 years ago. 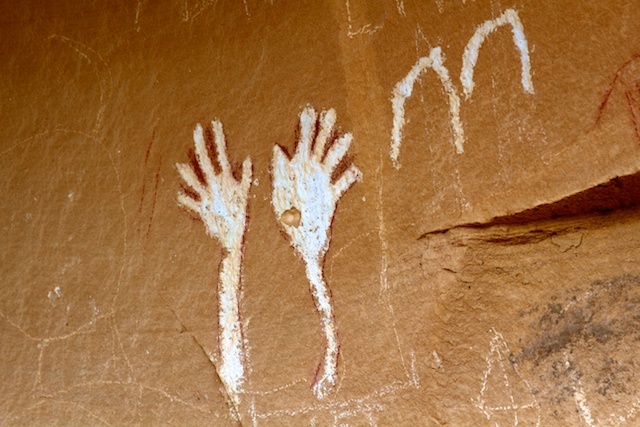 About 2,000 years ago the Fremont Culture settled here for around 1,000 years and left significant petroglyphs and pictographs. In the 1800’s Mormon pioneers gave the area its name, built homesteads and planted orchards. The buildings of the Gifford Homestead (the last residents of Fruita) are still standing and give a glimpse into pioneer life. The Gifford House is used as an outlet to sell pioneer arts and crafts, locally baked pies, bread and cinnamon rolls and homemade ice cream. (All very tasty BTW!) The orchards are still maintained by the park service. Visitors can pick all the ripe fruit you can eat in the orchards or pay a dollar per pound to take some home. For us, apricots are in season – Yea! Apricot crepes for breakfast Woo Hoo! There are a number of trailheads near the campground. The Cohab Canyon Trail starts with a series of switchbacks that get us up about 400 ft to the canyon. Here we explore hidden canyons and climb higher to the Spur Trail View Points for vistas of the Fruita Cliffs and the valley below. The Fremont River Trail is an easy stroll along the river and then a 480 ft climb for more panorama views. The visitor center trail winds along Scenic Drive from the campground to the Visitor Center. This trail is also bike friendly, so we ride here instead of walking. Just up Hwy 24 from the visitor center is the Fremont Petroglyph Panels with a wooden boardwalk, informational displays and mounted binoculars to view the panels. The only paved road in the park is Scenic Drive. 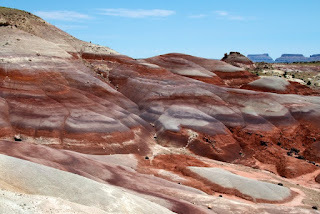 It winds 25 miles from the visitor center, past the homestead orchards, red rock monuments, tilting rocks, pocketed and rippled sandstone, washes and slick rock. This is the number one attraction here. The next most accessible section of the park is the Waterpocket District in the southern portion of the park. 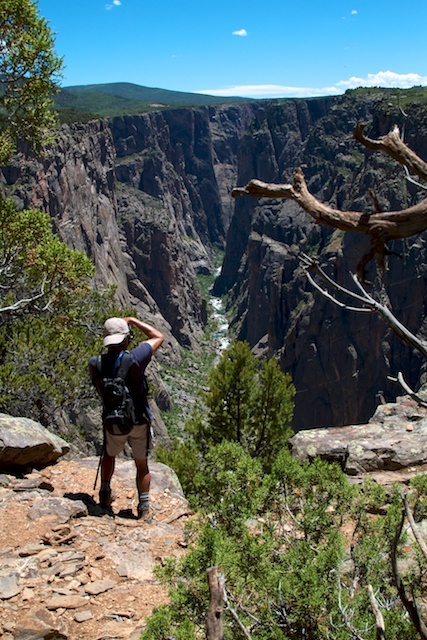 This is for the five-per centers looking for ambitious day hikes, canyoneering and backpacking. 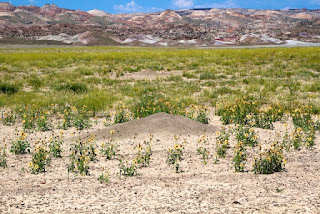 Notom-Bullfrog Road runs along the east side of the Waterpocket fold for 34 miles from Hwy 24 to Burr Trail. The first 11 miles are paved. In good weather the road is passable for passenger cars. 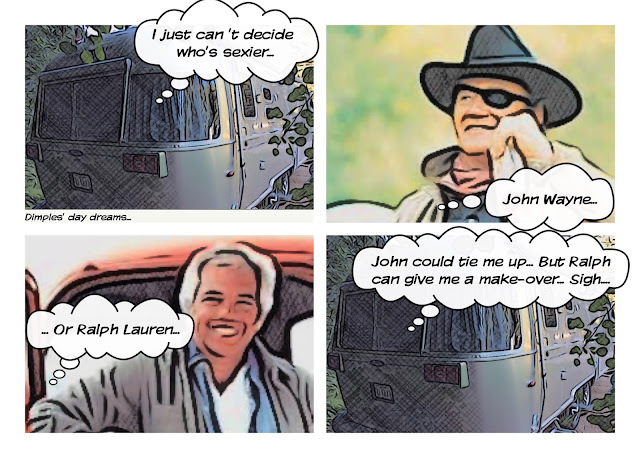 After rain, washes that cross the road make for slick and sometimes impassible driving. We drive this road multiple times during our stay in Escalante and while here and every time it’s a different experience, (One time after a heavy rain it’s totally impassable at the last wash before the Burr Trail intersection.) Along this road are the unmaintained and rugged (but well trodden) trails. 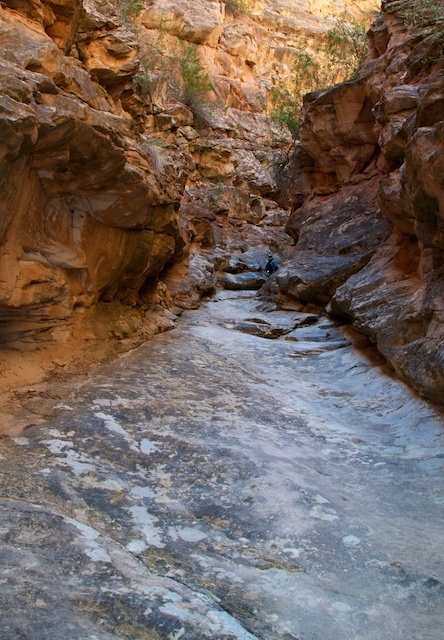 We hike Headquarters Canyon, which is considered the area’s best hike. It’s 3 ½ miles across the Waterpocket Fold and up into the canyon with a sandy wash, colorful rock formations, a good slot section a 35-40 degree sandstone ramp up to a 6 foot dry fall. We stop here for a snack and decide to turn around rather than climbing up only to walk a few minutes more to the 70 ft dry fall at the canyon end. 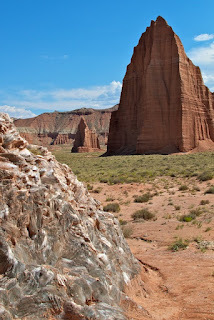 The third section of Capital Reef is Cathedral Valley to the north. Less than 1% of park visitors venture here. The primary deterrent is accessibility. With no signs of pavement and only a ghost of grading, it takes good weather, high clearance 4wd, and patience to complete the 59-mile Cathedral Valley Loop Drive. Before starting this drive, we stop at the visitor center to check road conditions. The Ranger hands us a half sheet with directions to make the Fremont River crossing. The journey also takes us across a zillion washes: dry, damp and wet. Eight miles from the park is Torrey Utah. In addition to the free Wi Fi at the visitor center, fuel is reasonably priced and the Chuckwagon is a good spot to pick up essentials like beer, margarita mix, a deli lunch and do our laundry. For a more upscale meal, it’s Café Diablo. 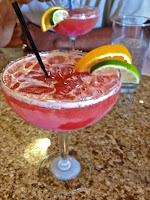 They have an impressive Tequila offering and a menu of specialty Margaritas. While perusing the menu we sip top shelf blood orange margaritas. We decide to split two entrees: The Steak & Green Chile Lettuce Rolls: Garden greens, roasted corn, crisp tortilla chips, green chile dressing and cumin cheddar cheese rolled in Romaine lettuce leaves topped with a perfect fillet of beef and the Shrimp & Crab Stack: layers of shrimp, crab, horseradish remoulade, mangos, tomatoes, avocado, red pepper and arugula. Both dishes were light, bright and balanced. The combination of these two dishes is our interpretation of surf and turf. The closest town to forage for groceries is Loa, 17 miles past Torrey. Royal Market is well stocked with reasonable prices. Fuel is a bit cheaper here. 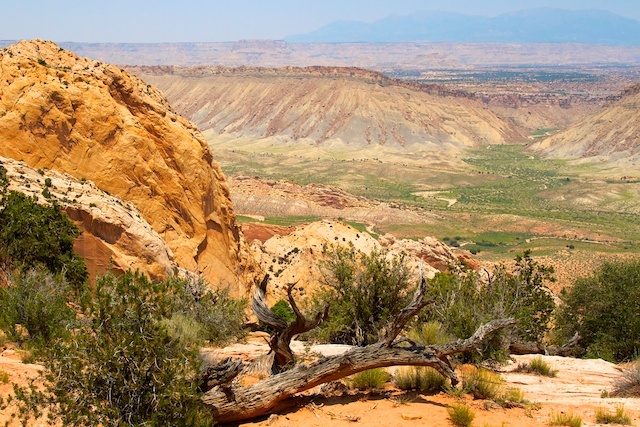 The Escalante-Grand Staircase and Capitol Reef are some of the most desolated spots in the US. We have just scratched the surface here. But July & August are not the months to explore the desert. Daytime temps are hovering around the 100 mark, and the monsoon season has started early so it’s off to Colorado to get high… altitude.